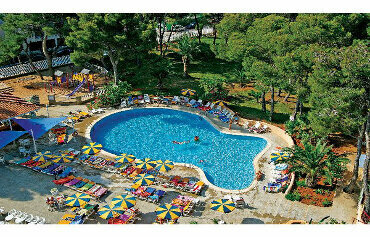 An old favourite with British holidaymakers, Es Cana holidays are all about the relaxation, beaches, bars and sunshine! 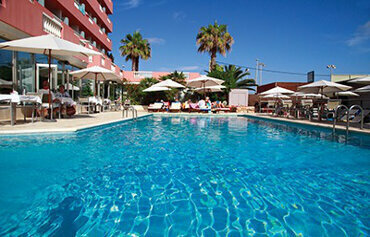 The beautiful resort of Es Cana has plenty to offer holidaymakers of all tastes. With superb sunshine and plenty to keep budding explorers entertained, a holiday in Ibiza is perfect if you enjoy sightseeing, sunbathing, and embracing the local culture. Summer temperatures can get up to a blissful 25°C during the summer, so to make the most of the fabulous weather, you'll definitely want to spend some time on the stunning Es Cana beach. If you prefer sightseeing to sunbathing, you'll be thrilled to know the pleasant spring temperatures of up to 18°C make Es Cana an ideal Balearic holiday destination at quieter times of the year, too. Kick off your shoes and stroll along the golden sands of the picturesque bay. The long, horseshoe-shaped beach is a delightful haven of golden sand and crystal-clear waters. Why not grab your towel and enjoy a relaxing day of sunbathing before you take a refreshing dip in the water? If you prefer an adventurous day out, make the most of the beach watersports available, such as windsurfing, parasailing and even the famous banana boat rides! You'll certainly be spoiled for choice of things to do on your holiday to Es Cana. Alternatively, perhaps you're keen to unleash your inner explorer. If this sounds like you, then you're in luck. Ibiza's capital, Ibiza Town is only half an hour away from Es Cana, where you can enjoy strolling through the quaint streets of the Old Town and admire the magnificent architecture. If you're keen to do some island-hopping, take a trip on a glass bottom boat trip from the harbour or hop on the ferry to the nearby resort of Santa Eulalia. You'll certainly be spoiled for choice of things to do on your Es Cana holiday. Exploring the stunning Old Town allows you to get up close with the region's culture and history. The UNESCO World Heritage Site in Old Town features extraordinary Renaissance military architecture, so you'll definitely want to bring your camera with you! If you want an unforgettable experience, get your walking shoes on to explore the hills and enjoy the stunning view from the top. You can reward yourself with a refreshing glass of sangria or a beer afterwards. Exercise is very thirsty work, after all! Nightlife in Es Cana is relatively laid back compared to other Ibiza resorts such as Ibiza Town and San Antonio, making it ideal for families and couples. San Antonio is just over half an hour away and the perfect resort for party animals, who'll love the legendary nightlife and big name DJ sets. Es Cana has a selection of friendly bars and restaurants to spend a quiet evening over a fantastic meal and a refreshing glass of sangria. Restaurants serve a variety of international cuisine, including modern British, Chinese and Italian dishes. You can also indulge in traditional Spanish dishes like freshly-caught fish and seafood. For those looking for a quick bite to eat, a number of fast food restaurants also offer speedy meals. To make the most out of a holiday to Es Cana, call Hays Travel today and trust us to book a exciting getaway to Ibiza for you. We have over 37 years of experience in booking memorable holidays to Spain and the Balearic Islands, and we have been voted the UK’s Best High Street Travel Agent - so you can trust us to help you plan a truly unforgettable trip. The 4 star all inclusive Azuline Atlantic Aparthotel is located in the centre of Es Cana and just 200m from the golden sandy beach. 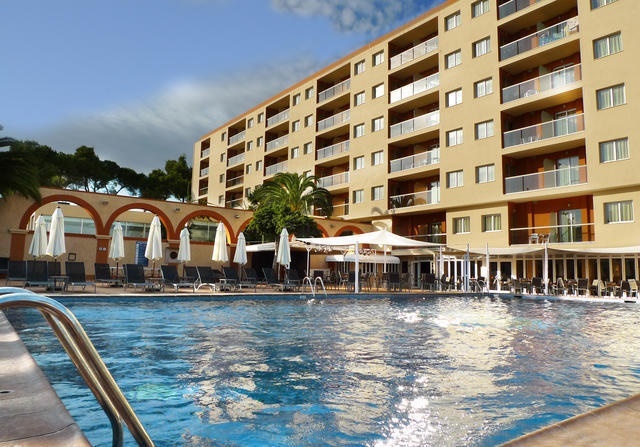 Daytimes centre around the large swimming pool and sun terrace, the perfect places to kick back and relax in the sunshine. Take a short stroll away from the crescent shaped beach in Es Cana and you will discover the 3 star all inclusive Invisa Hotel Ereso. The 3 star all inclusive Paraiso Beach Hotel is located a short hop from the beach in Es Cana. This bright and modern adultsonly hotel is a favourite with guests who enjoy the abundant facilities and relaxed atmosphere. Chill out by the pool during the daytime or take a stroll to the nearby Cala Martina beach. Hotel Anfora Playa is a hotspot for families. This Ibiza hotel is jam-packed with on-site facilities and is within walking distance of both the beach and the famous hippy market. 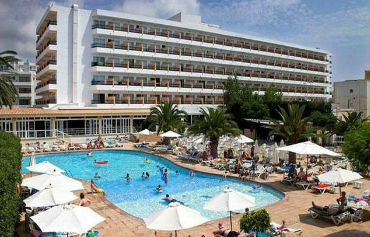 For family fun in the Ibiza sunshine, why not take a peek at the Hotel Caribe in Es Cana? 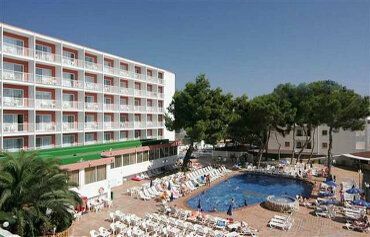 This recently refurbished Ibiza hotel boasts a prime location, just a short hop from the golden sands of Es Cana beach. Holidays in Es Cana are all about the beach, where you can enjoy watersports galore including windsurfing, pedaloes, parasailing and banana boat rides. If the beach is not your idea of fun, then a sightseeing trip to nearby Ibiza Town is a must, by day you can wander the cobbled streets and at night the place comes alive. Or take a glass bottom boat trip from the harbour or hop on the ferry to the nearby resort of Santa Eulalia. The night life in Es Cana is fairly lowkey, compared to the other better known resorts in Ibiza. There are a variety of friendly bars and restaurants to relax in when the sun goes down, where a meal and drink are the order of the day as opposed to partying until dawn. Es Cana is relatively inexpensive for dining out with a good selection of cafes, bars and restaurants to try. So whether you're looking for local culinary treats, international favourites, British fare or fast food options, you'll find them all on the menu in Es Cana.